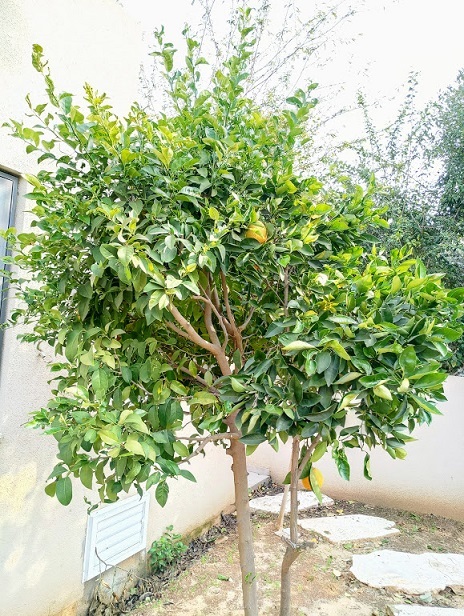 How to prune orange trees? 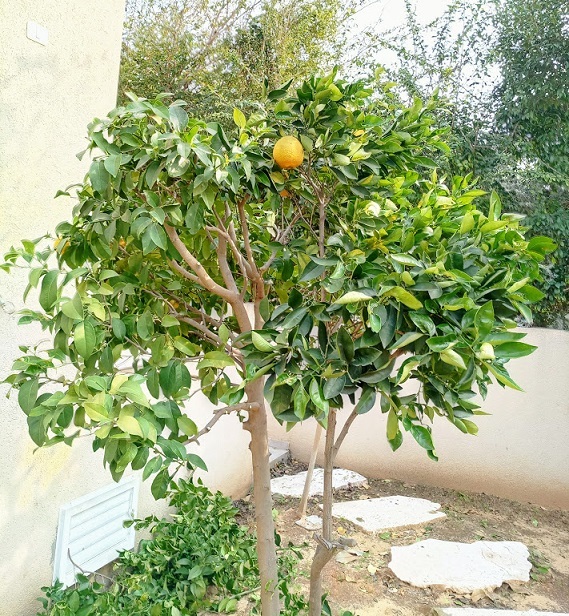 Pruning orange trees - here are our two orange trees, they’re a little on the small side, but compared to their yield, we feel like we own an orchard. The trees produce dozens of fruits, and I hate to admit it but most of them are left to rot on the ground because, really, how much orange pie, orange jam and orange cake can one family and their neighbors eat?? I could reduce the amount of fruit by pruning some of the blossom clusters, but when they come out and I think of the two trees and how great they look covered in fruit…. I just can’t bring myself to dilute anything. Word of caution, while pruning orange trees please make sure to wear your working gloves. If you've decided you're pruning orange trees, you need to know you'll meet their sharp thorny stems and shoots, and they hurt. Why it needs pruning. Here is one of my trees - you can see the density, and the many cross branches. Those of you who have a keen eye and sharp vision may also be able to see the thorny dead branches. At the top of the tree, you can see long stems that reach out above the tree’s canopy. So, what you need to do is clean things up a little. It will serve both you and the tree’s health. So, let’s prune! When to prune? As with all citrus trees, wait until the last fruit have fallen off the tree. You can prune citrus throughout the year, including winter, and you won’t harm the tree. This is especially true for regions with a warmer climate. Plus, there’s the fact that we’re not doing hard or renewal pruning. Where to begin? Start by creating a path. Yes that's right. Prune your way inside the tree, it will give you a better look from inside out. Where to start? I always make my path into the tree from the north side of the tree. By clearing a path, you'll create a natural hole, which is good and healthy for your orange tree. By making the hole in the north you'll allow more light and fresh air to penetrate, and enable better circulation. The trunks of citrus trees don't like too many hours of direct sunlight, so avoid making your path into the tree’s center from the south. North will serve it better. O.K, then – let’s prune. Remove a few branches with one hand and search for the long thorny stems and shoots with the other. Some will have grown and developed high above the canopy during the season. When you see them, follow them down until you reach the point where they leave the main stem or trunk, and cut as close as you can to the main stem. Once you’ve made the cut, simply pull them out. 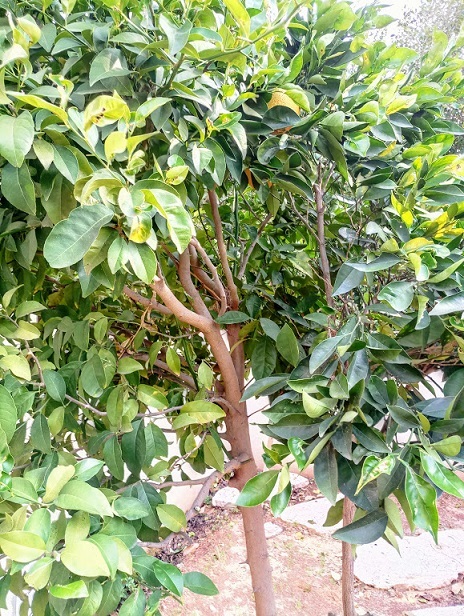 Your pruning orange trees lesson continues – next to be pruned are the dead branches, twigs and shoots. Prune and remove them as you come across them. Things will now become cleaner and clearer. You should now start seeing new leading stems, which were hidden only seconds ago. Well done! Stage three – You should now prune 1 or 2 branches that will allow light to penetrate the tree’s center from the top. I always make sure to open a small "window" at the top of the tree. Don't be afraid, find at least one branch that holds a significant number of leaves and prune. That’s right - prune it. And if it has a diameter larger than 1 inch, make sure to smear pruning sealer on the stump to prevent diseases and fungus. What else needs to be pruned? Well, that's obvious. As I always say, let’s talk about the height. Reduce the trees general height. 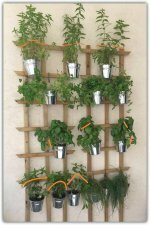 It will help you train and care for your orange tree easily, and make fruit picking easy and fun. Don't look for the right place to cut, just cut wherever it feels right. But remember, don't prune when your tree is in full bloom because you'll lose future fruits. 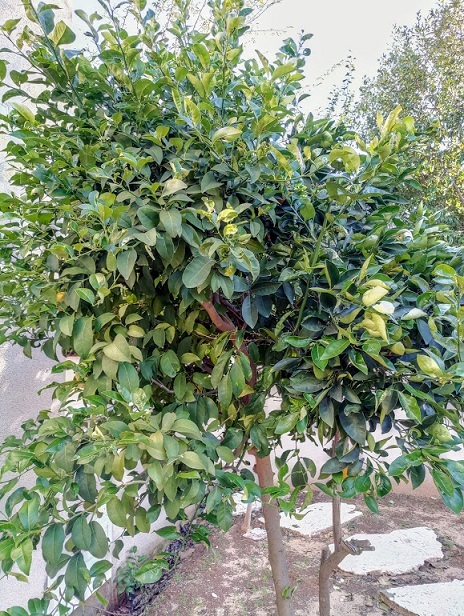 Pruning orange trees? It only takes 25 minutes, including a coffee break, and needs to be done only once a year. Throughout the year, all you need to do is routine pruning which means removing shoots, twigs, and dead or broken branches. That’s it - that’s all it takes to have a healthy happy smiling orange tree. My orange tree’s final look. I think he looks happy, don’t you?